Weiner Tales: Don't Blame Me...The Bookstore Made Me Do It! It's no secret that I love to read. As an insomniac, it's one of my favorite ways to spend a night! I found a kindred spirit in my bloggy friend Sara from Unwrap Life. She always has a few good books on her "to read" list! Now you'll never have to ask again. Why? That's right! 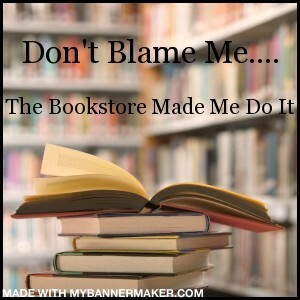 You asked and we answered - with a brand new book review blog called 'The Bookstore Made Me Do It'! We'll review the good, the bad and the ones we couldn't even finish. To kick off our new blog, we're having a giveaway. You know, 'cuz we're just nice like that! Sara is giving away a book by one of her all time favorite authors, Jodi Picoult. After some thought, I realized I don't have a favorite author yet. There are just so many fantastic ones out there. Instead, I'm giving away the book I did my first review on. Want to know my thoughts on it? Click on over to the new blog and find out. 2. Let us know what you think of our new setup by commenting on each of our first book reviews. (Up to 2 entries) We're looking for constructive feedback here. Did you like what we covered? Did we miss something you would have liked to know? Do you want us to keep it shorter and sweeter? Or give you more detail? 3. Share your favorite book or author with us. (1 entry) What book could you read over and over again? What author are we totally missing out on? Contest runs from today through Friday, March 12 at Midnight (EST). Winners will be announced next week on The Bookstore Made Me Do It. And don't forget to check out Sara's book giveaway at Unwrap Life, too. It's double the giveaway fun! Well you know I LOVE books. Can't wait to see what you guys are reading. One suggestion I have it to move the "grade" to the top with a short line or two with what we need to know. That way if a reader just wants the must-know stuff it is right up front, and they can read on for more. Happy reading! Oh, how fun!! I love reading and collecting books! How exciting! I am nearly finished reading all of Jodi Picoult's book (at least all of the ones in paperback). If you ever want additional contributors let me know! I'd be interested! I always get to the point of finishing a book and then trying to figure out how to share it! I'm following your new site and I commented as well. As I said over there, I don't really have a favorite, but I'll always trust a new book by a writer I've enjoyed in the past.